We spoke to a revered mastering engineer who worked on Butterfly Effect in an attempt to learn about one of the most hyped and enigmatic records of the year. 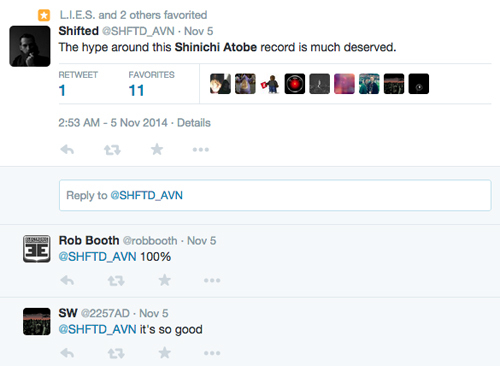 I agree with everyone: the new record from Shinichi Atobe, Butterfly Effect, is incredible. Experimental duo Demdike Stare released 600 copies of the double LP in late October, and within a week or two they were sold out of Boomkat. I ordered a pressing from a Discogs seller who had been instructed by the distributor to only sell one copy per customer, which is a measure labels and shops take when a product is in high demand. 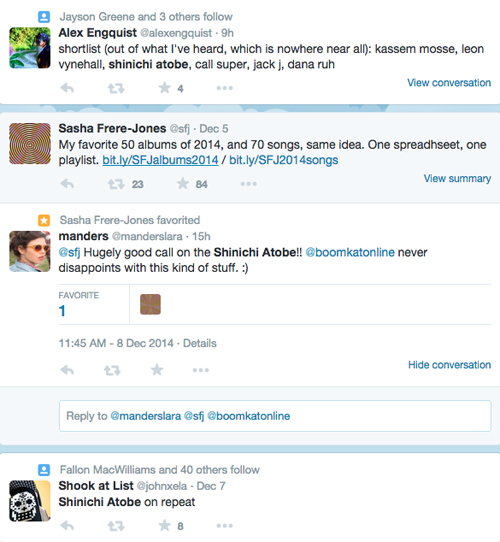 And if I haven’t convinced you yet that this Shinichi Atobe record was popular among my devoted producer/DJ friends, dance music writer peers, and fellow techno obsessives, here are a few screenshots people gushing about the record on Twitter. Despite the fact that Butterfly Effect garnered a notable amount of excitement from listeners, record buyers, DJs, and writers (including the New Yorker‘s resident music scribe Sasha Frere-Jones), so far the techno-oriented press hasn’t reflect its popularity, which is a curious phenomenon that applies to several other artists who produced popular records but successfully and intentionally avoided press, like Terrence Dixon and Beau Wanzer. A few outlets posted news stories to announce Butterfly Effect‘s release and reviews to follow it up, and it scored a high ranking on Juno Plus’s year-end list, but no one has published a feature about Atobe. That’s odd because it’s gotten so much love and because the press release that accompanied it detailed quite a juicy and compelling backstory. 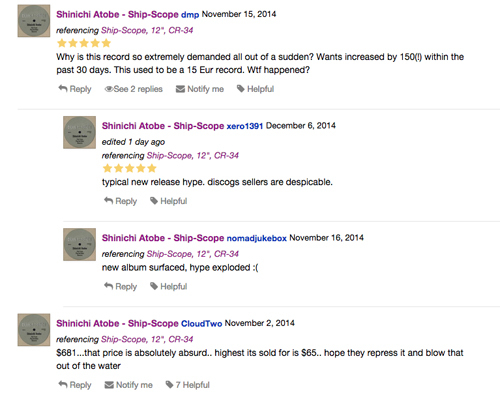 In short, Shinichi Atobe released one of the last and most expensive records on Basic Channel’s revered Chain Reaction imprint in 2001, a delicate, melancholy, and absolutely beautiful hypnotic 12″ called Ship-Scope. He never made another record, until Demdike Stare tracked down the mysterious creator and convinced him to give them a wealth of material from the past years, which became another collection of enveloping tracks and mangled, ambient-leaning tunes called Butterfly Effect. I reached out to a bunch of people in an effort to flesh out the details of the record’s intriguing backstory, but most of my leads quickly ran cold. That’s probably why no one has done a longform piece it, but I didn’t want to rely on input from the producer or label to determine whether and how I cover music that I find amazing or otherwise worthy of investigation. 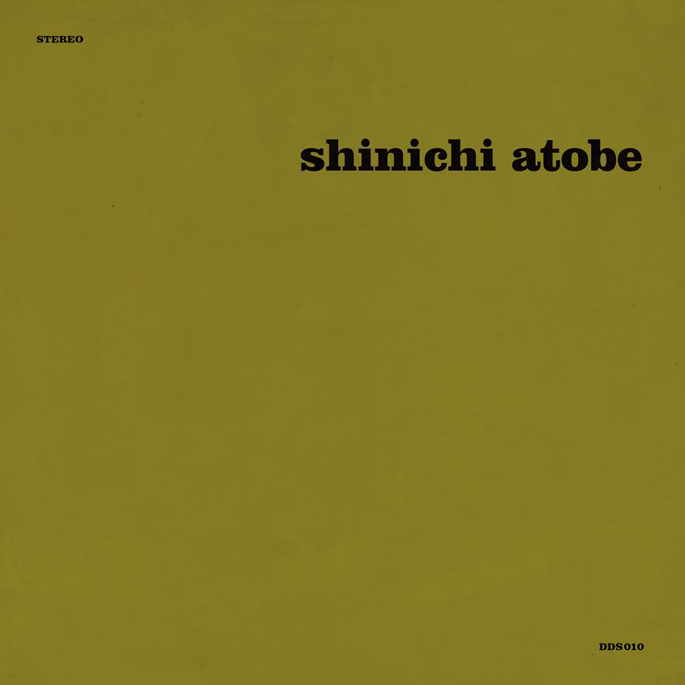 So I kept at it till I found someone who was willing to chat about Shinichi Atobe: Matt Colton, an established mastering engineer at Alchemy Mastering in London who worked on the album. It turns out that Colton didn’t know much about the album or artist either, but he did have interesting insight on what makes Butterfly Effect such a seductive listen. How did Butterfly Effect first come to your desk? I hope it isn’t too disappointing of a story for you, but it came to me because I do a lot of work with [the record label] Modern Love and with the Demdike boys. As they were putting it out, it found its way to me. I mastered it and cut the record, and that was it. I’ll be totally honest with you—the only thing I knew about it was the catalog number. I didn’t have any information on the artist’s name or any of the backstory or anything when I was working on it. I just had the track titles and the catalog number. When did they send it to you? It was back in the summer, I guess maybe June or July, something like that. No one sat in on the session, I just mastered it, and the files were sent back to the distributor and the label, and they were approved, and then I cut the lacquers. You’ve pressed quite a few Demdike Stare and Modern Love records. Have the the guys ever sat in on a session with you? No. In many ways, it’s a shame. I started doing this in the late ’90s, which was not pre-Internet, but before you could send studio-quality recordings easily over the Internet. If someone wanted you to cut a record for them, they’d have to postal courier you the DAT or the CDR or the analog tape or whatever. What happens most often is that people would come sit in on a session, partly because they’re interested and partly because they didn’t want to trust the recordings to a courier or the postal service. I would say that’s a preference for me, because it’s nice to hang out with people and listen to music, basically, and meet new people. But, these days, most of the time, people just send their stuff over the Internet. I’ve read in other interviews with you that it helps you to get a vibe for what the music is trying to evoke emotionally, or what the artist would like the recording to sound like. In a case like this, where they didn’t even give you the background and you couldn’t be in the studio with them or the artist, how do you get a sense of the textures and emotions that they wanted? It’s much easier when you’re chatting with someone and sitting next to each other to pick up on how you think they probably want to hear something. Ultimately, I’m trying to provide a service to those people that employ me, so I want them to love the sound of the records that they’ve asked me to master for them. With a project like this, because we’ve done a lot of records together, I think I know the kind of sound that they’re going for. But if you don’t have any instruction, then you take your cue from the music that’s been provided to you. When I listened to the Butterfly Effect tracks, they sounded a little bit bright, and the hi-hats were pretty loud in the mix. I felt that it was just a little bit cold-sounding. What I wanted to introduce was just a little bit of warmth, the analog character. But one particular track, which he called “Vibes,” [Editors’ Note: We think he’s talking about “Butterfly Effect” or perhaps “Free Access Zone 2”] is a rolling house track, that felt very warm, and the bottom end is lovely on that track. That particular track had a real enveloping sound to it. I wanted the rest of the record to match that a little bit more, and I felt that the majority didn’t quite have the bottom end and quite have the warmth. I just tried to bring the other recordings more toward that vibe, because they were all sounding good, but maybe just a little injection of that was nice, pushing a little bit of midrange warmth and fatten up the bottom end and sub bass. A repress of Butterfly Effect is back in stock at Boomkat.